small dried flowers and ribbon for bouquetBODYCut a piece of Am-Twist paper 12″ long, untwist. Using scissors cut both ends so they are rounded. Loop the paper in half leaving the end closest to yourself 1/2″ higher. Using a piece of floral wire, gather paper together and wrap wire 2″ from end. At wire, fold ends towards yourself creating a layered collar. Take remaining 6-1/2″ paper in same color and loosen the twist without completely untwisting paper. Place arms inside the loop body and glue center of arms to the back. Fold arms down to front of body and glue ends together. Take the 4-1/2″ piece of iridescent wire and place it through the hole of the wooden head. Wrap one end of wire around finger to form a halo. Glue head to wire to secure. Glue straight end of wire to the back of the body so head rests on collar. First cut a 1/2″ piece from white or ivory paper and set aside. Untwist remaining piece and round the ends forming 3 scallops on each end. Gather at the middle and place small amount of thin wire to hold. At the wire, glue wings to the back of body covering iridescent wire. Untwist 1/2″ paper and cut in half. Using only one of the halves twist once at the middle forming a bow tie. Glue to collar. Decorate hands with dried flowers and ribbon. 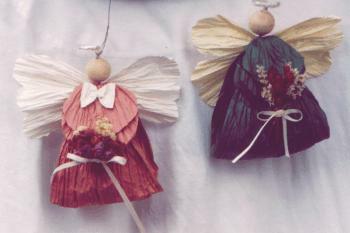 Make several of these ornaments in various Am-Twist colors to decorate an entire tree. Accent tree with paper bows in matching colors.